Boo Bling not only tastes great, but looks ghoulishly cool too. Each piece is made up of different flavors for a delicious new piece of jewelry. These Pumpkin Lollipops are HUGE! Packed with orange flavor, these pops are almost too cute to eat. Hershey’s Cookies & Cream skulls are delicious and ready for any candy dish. They have pretty skull designs on every wrapper for an extra touch of Halloween. There is plenty of Halloween parade candy treats aside from these! 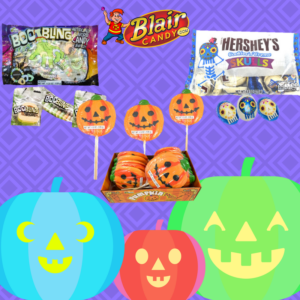 Try one or more of these today by visiting BlairCandy.com. Regardless of what you try, you’ll find that they go great with your all time Halloween candy favorites.